The Miller Tanner difference is our people. That’s why we want to introduce you to our team of superstars that brings our corporate meetings and events to life for our clients. 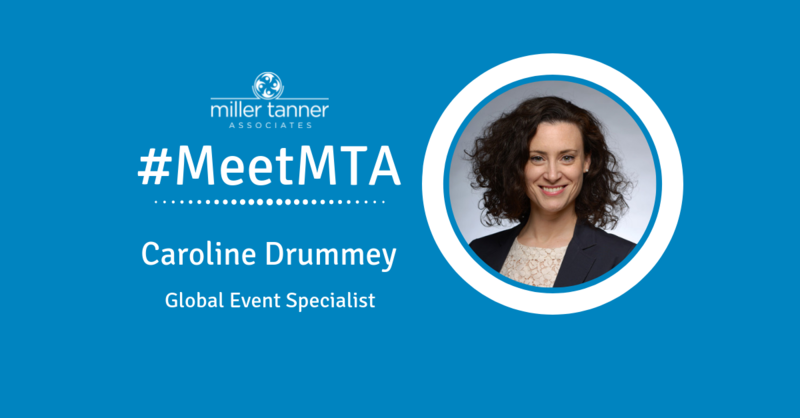 Today we introduce you to Caroline Drummey, Global Event Specialist. Caroline, our associate based in Ireland, brings a wealth of talent to our team. With an eye for detail, she manages responsibilities ranging from the invitation launch, attendee registration, and welcome packages to working on site to ensure a seamless event. Tell us about your current role with MTA? My role at MTA is a global event specialist (GES). Although there are various responsibilities under that particular title, I have three in particular which can be spread out over various events, allowing for expanded insight and involvement. As a collateral GES, I create the invitation suites and confirmation notices which are sent to the invited and registered attendees. This is fun as it highlights the chosen city, country, and hotel destinations, which often spark curiosity. Confirmation notices are important as we ensure attendees have all the relevant information required for their journey to and their time at the event, such as flight details, ground transportation, and hotel information, along with equally important information about the local weather and dress code. I also create the welcome packages ahead of our team traveling onsite. Upon arrival at any given location, the attendees will receive this package which offers them important information about the event itself. These vary depending on the type of event, but we try to ensure our attendees feel comfortable throughout the duration of their stay. As a data GES, I am responsible for dealing with the numerous registrations once received, to liaise with the attendees regarding their site/company participation and to send their details to our global travel partners. Averaging once a month, I travel to an event location to be apart of the on-site team. This is a great experience as it enables us to see all the hard work come to fruition. It can sometimes mean long hours and often too much chocolate, but the latter helps keep the energy levels up! How long have you been with MTA? I’ve been with MTA just over 3 years, which have flown by! What did you do before joining MTA? I was a video editor for a television production and distribution company in London. This was a wonderful, creative, and varied job, with great friends, in a vibrant city. However, I soon realized that my heart was back home in Ireland and so I was offered a great opportunity to work in the facilities department of a new national facilities organization. This position brought me back to my administrative roots and developed an understanding for the importance of the “behind the scenes” of the general operations of a building, a company, an organization, and subsequently, an event! I love the thrill of working on site, welcoming the attendees to the hotel and being involved in their experience of everything planned to date. As we are based from our homes, it is great to work with the friends and colleagues I see so rarely. We deal with curve balls, lighten one another’s spirits, and hope that if timings allow, we may even venture out of the hotel to explore either an exciting city, or some stunning scenery. What’s been your favorite event destination as an event planning professional? Rome, Italy has been my favorite destination. This may just be the answer of someone who sees Rome as her favourite city anyway! With so much history and culture, it is such a joy to visit. Logistically, there are enough flights each day from most European cities, thus making it a straightforward event destination. I’d need to answer a separate questionnaire to fully discuss the wonderful food and wine! What’s been your most memorable event to date and why? Not that every event since hasn’t matched up, but I have to say my most memorable was my first event with Miller Tanner. It was in Budapest, a city I had visited as a young backpacker, and had always wanted to revisit. The architecture along the Danube is breathtaking. Although it’s a very old city, there is a great new young vibe to it which makes it a fun and happy place to be. I was welcomed so warmly by wonderful people who were so friendly from the outset; we had a lot of fun as well while working hard to deliver a successful event. I also learned there and then, that high heels are not the best options for event management. Do you have a few great travel tips that you could share? Travel with everything fully charged, and with something tangible to read at hand. One doesn’t know what might happen while making a journey, long or short. There are only so many plug outlets in stations and airports. If stuck in a delay, it’s comforting to literally have the power to inform someone of the situation, and then it’s also nice to have something read during what may be a tiresome time. I go with my good friend to a couple of classes in the gym – Circuit Training and Box Sanity, which is a way to great de-stress while kickboxing to great music. I also love going to concerts as often as possible, and course I love the usual Saturday night out in town with friends. I enjoy going to cultural festivals – music, food and comedy. Each August, I actually volunteer in the press office of the Rose of Tralee Festival, the best week on my hometown’s calendar! You are originally from? You currently reside in? What do you enjoy most about living there? Any favorite spots that you would recommend to tourists? I am originally Tralee, Co. Kerry on the South West Coast of Ireland. Having spent time in Dingle, Cork, London and Dublin, I have made my way back to Tralee! Although Tralee is a great to visit all year around, it is particularly brilliant during the Rose of Tralee Festival, held annually in August. It is an international event which is celebrated among Irish communities all over the world and it is fun for all ages! Dingle, where I went to boarding school, also in County Kerry, is a stunning little gem with the most spectacular Wild Atlantic Way scenery and the best pubs in Ireland. What makes Miller Tanner stand out as meeting planning company? What’s your favorite aspect about MTA? I think MTA stands out because of our dedication to our clients to ensure that their events are as fully attended as possible, are so smoothly organized that they themselves can focus on the content, while we focus on the logistics. We actually CARE that the time invested results in the best output for the client. My favourite aspect about MTA is my team. As we work virtually, when we travel on site to execute an event it can be so rewarding to learn from them in person, whether it is a work related item we are figuring out, or a funny anecdote about their personal lives. It’s so much fun to sit back face-to-face and share the stories of the day!